Considering the foundational aspects of Salvadoran cuisine include dishes I hold near and dear (overfilled sandwiches, fried starches and stuffed tortillas), it's not surprising that I eventually sniffed out Juanita Restaurant (271 W. 900 South, 385-259-0144). It's a cozy little spot that's easy to miss when you're cruising through the Central Ninth neighborhood, but it's definitely a good excuse to stop and smell the loroco. If you're in the mood for some comfort food that'll broaden your horizons with some Central American staples, this is the place for you. For novices to the food of El Salvador, all roads lead to the pupusa. It's a pancake-sized corn tortilla typically stuffed with all manner of deliciousness—eggs, rice, beans, cheese, shredded pork—and is traditionally topped with a thin tomato sauce and a vinegary cabbage salad spiked with red pepper. While it's easy to be deceived by the pupusa's unassuming exterior, its balanced texture, flavor and portability have made it a Salvadoran mainstay. 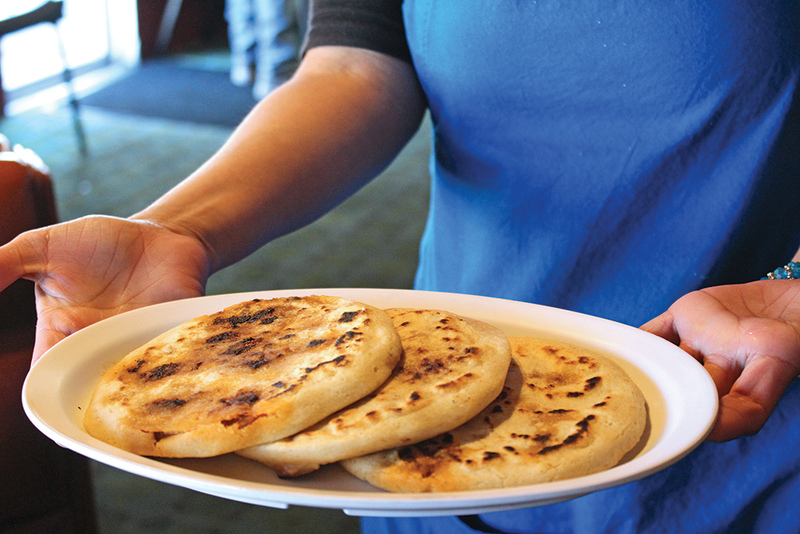 Pupusas are essential to Salvadoran cuisine, so Juanita takes their creation very seriously. Each one is lovingly prepared on the spot—one of the first things that I noticed when I popped in for lunch was the bilingual signage letting customers know their food is made to order, which can add to the wait time. If that's a turn-off, then these golden rounds of crispy gooeyness are too good for you. Juanita sticks to the traditional fillings—cheese, beans, pork chicharrón and loroco, an edible flower native to El Salvador. 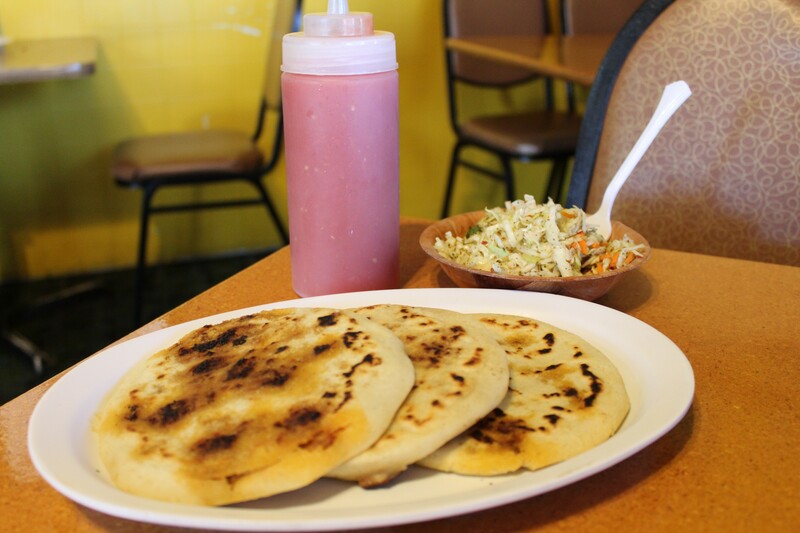 Pupusas run from $1.75 to $2, which is a great deal for the amount of flavor you get. As far as picking a favorite goes, it's hard to choose between the chicharrón and the loroco. The term chicharrón might make you think of crispy fried cracklins, but the Salvadoran version is far from it. The chicharrón here is tender, slow-cooked pork that melts in your mouth. Loroco is reminiscent of cruciferous veggies like Brussels sprouts—they have a wonderful bitterness that complements the melty cheese interior. It's totally understandable if pupusas are the only thing you order here, but it's also worth venturing into entrée territory. My go-to is a the plátanos con crema y frijoles ($6). It's traditionally eaten for breakfast—Juanita also offers a combo that comes with scrambled eggs cooked with peppers ($11)—and it's possibly one of the most crave-worthy breakfast dishes on the market. It's a hefty portion of plantains, sliced and fried to perfection, topped with velvety crema and pinto beans that have been puréed into a sauce of their own. Like the pupusas, this dish is a prime example of doing something simple extremely well. The sweet starchiness of the plantains meshes seamlessly with the salty creaminess of its companions; the combo's scrambled eggs and side of tortillas ups the ante to redefine the term "breakfast of champions." My only gripe about the place is that the menu lacks Salvadoran sandwiches like panes rellenos and pan con chumpe—I've wanted to add these bad boys to my international sandwich repertoire for some time now. But, there's no sense in complaining about what the menu doesn't have, when what it does have is more than enough to satisfy. In fact, the most attractive thing about Juanita's menu is that it's perfect for mixing and matching. I love getting a dish like the plátanos with a few pupusas on the side and combining the various flavors and textures with each bite. It's a snapshot of how versatile Salvadoran food can be—each dish on its own has simple flavor combinations that transcend the individual ingredients, but it's fun to throw some other menu items into the mix and see what happens. Whichever combo you decide on creating, I must advise you order a bottle of Kolashampan ($2), a nuclear-orange Salvadoran soda made with cane sugar, to round out your meal. Nothing quite refreshes the palate like this vaguely banana-flavored, ultra-sweet beverage. Salvadoran food is as comforting as comfort food can get, and Juanita's attention to detail and made-to-order menu is what makes it a welcome fixture in the Central Ninth neighborhood.